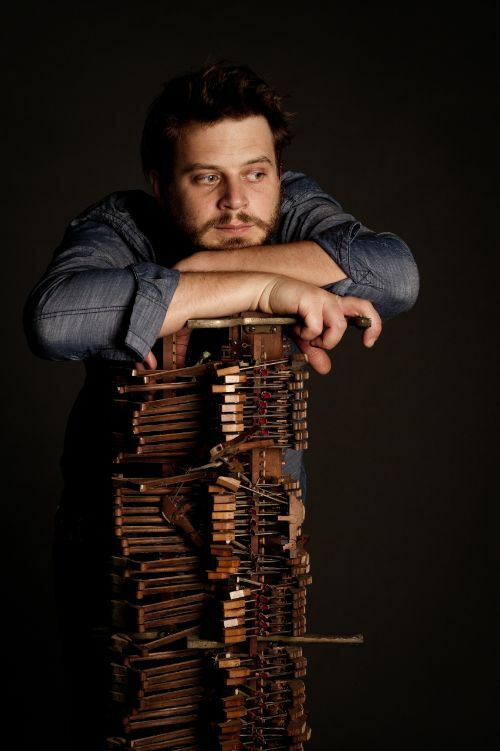 Today Marco Benevento‘s Facebook page bears the following post: keyboard ….drum machine …..tape recorder …..AM FM radio ….. ……friday’s a good day to party. The video that follows shows him launching the drum machine and improvising on an old Casio keyboard. Glory be— while most of the world has become numbly enslaved to the latest smartphone apps, Marco is still revelling in the unexplored creative possibilities of bygone technology. When I interviewed this Brooklyn-based experimental composer and performer back in 2009 he struck me as one of the happiest and most creative artists I’d ever met, almost godlike in his capacity to produce new sounds and to manifest a perrenial gladness. I’ve since run into musicians who studied with him at Berkeley or who jammed with him and they always light up at the sound of his name. And he’s still happily creating, recording, and touring. May it ever be so! It was Benevento who first introduced me to the concept of circuit-bending toys, a serendipitous development if ever there was one. It was also Marco who introduced me to Kenny Werner’s book, Effortless Mastery, a tome that changed my musical life as well as those of musicians I loaned it to. 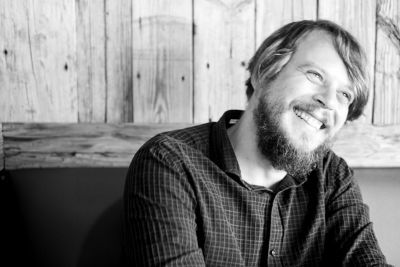 “Marco Benevento is an incredibly easygoing guy who in spite of a hectic bout of touring was so happy with his life he couldn’t help radiating bliss rays, even over the phone. An incredibly accomplished musician, he still seems as excited about music as a child on Christmas morning trying out (or taking apart) his new toys. To briefly explain the technology, circuits are rerouted and the circuits tested until interesting new sounds are discovered. Then the circuits are “bent” to recreate those sounds at the touch of a switch. I grew up in Wyckoff, northern New Jersey. After my piano and organ lessons as a youngster I eventually got into rock and roll. I was in bands in high school that would play at sweet 16 parties. It was kind of a natural evolution for me, coming from a rock background and then going to Berkeley and studying a whole bunch about jazz and then sort of getting into a combination of both. I guess being in Manhattan was the biggest influence. I played in a band from Manhattan when I was 18. On an amateur level, when I was about 16 I did a soundtrack for my friend’s movie, Apples of Eden. It was a made-up story about creatures and goblins in the Jersey forest. I made sort of a Dukes of Hazard soundtrack about it. I’m not doing anything with TV or movies right now. My feats are out there in the world, and I wish that somebody would pick up on them one of these days. I did this gig at Carnegie Hall with this really great piano player from the UK named Jamie Collins. He was involved in the soundtrack from the Clint Eastwood movie Gran Torino. He’s been really into my music, which is why he asked me to open for him at Carnegie Hall, which was very flattering to me. He hangs around with Clint Eastwood quite a bit, and I am kind of hoping that he will give him some of my work. I play percussion and guitar as well as the keyboards. I remember being so interested in synthesizers as a kid. I took college music synthesis programs in high school. I studied about what music means, or what makes a sound a sound. I remember that would sort of lure me into my room where I would put on my headphones and play my keyboard. There is so much you can learn as a kid, and then when you actually hear someone do what you are learning something clicks, and you think, Oh, it’s that easy, or, it’s more conceptual than technical. I had a great conducting teacher in school say that it’s all concept. He said that you can have all the technique you want, but without concept, you’re screwed. A big influence to me was Kenny Werner. I’ve studied with him on and off through the years. He wrote the book Effortless Mastery. I read it when I was 18. It was very easy to read and made a lot of sense. I maintain a high level of energy on my tours with lots of water, lack of sleep, and having a two-year-old, just to name a few. Music is something I’ve studied my whole life, and I’m still learning the depths of it. It’s like a quest. Me Not Me, my new CD, is the most interesting one to talk about. I spent many sleepless nights on it. Circuit bending is a new art; it’s no more than five years old. It came into my life when I was touring around with Joe Russo. The Russo duo was a big part of my musical life. We had a show in Chicago and somebody we didn’t even know came to the show and said a friend of his told him that we were into this sort of thing, and he hauled out a duffle bag full of circuit bending toys. I just sort of lost it. I thought, this is it—I love this stuff! He’s been sending me stuff for the past five or six years, and every time I tour I always go to Chicago so I get to see new things that he’s made. Acoustic music is brilliant because of the beautiful emotional quality happening, then when you get into this sort of a glitchy underworld, it becomes like a David Lynch movie, which is a whole other colour of emotions. It’s sort of intertwined or sewn together, so one instrument, for example the piano, can have historic and has emotional acoustic qualities that date back as far as three hundred years. Then you have this brand new toy with batteries in it that has sound you can use to make music with and edit. I had my circuit-bending toy plugged into my loop router, which is something you plug an instrument into; it records a sound and then you just sort of play it back over and over, and then you can record another part over it, making what is known as a loop. I was using a loop station and a circuit-bent toy to record tracks and tracks on each other, and I came up with three tracks to start the song, which are the melody and harmony. I let that play while I was walking around the house, or doing dishes, or whatever. It was sort of like translating the notes from what I was hearing onto the piano. My one strongest religious belief is that there are higher powers and a god or gods, and there is a universal relationship with them and everybody in this world. There are certain things for all of us that help us connect with them. I use music to recognize that.